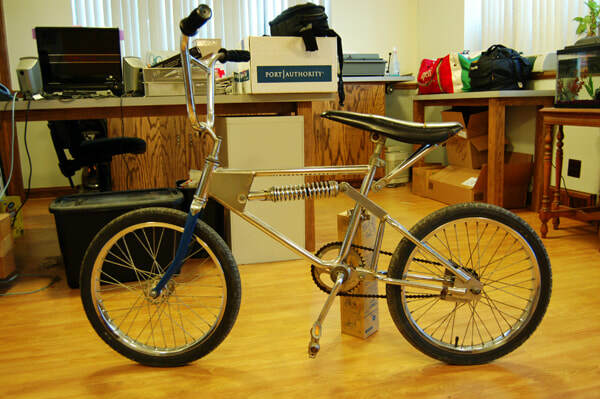 In the early 1970s, BMX (bicycle motorcross) had taken the youth of the nation by storm, much like the hot rod generation of the 1950s. 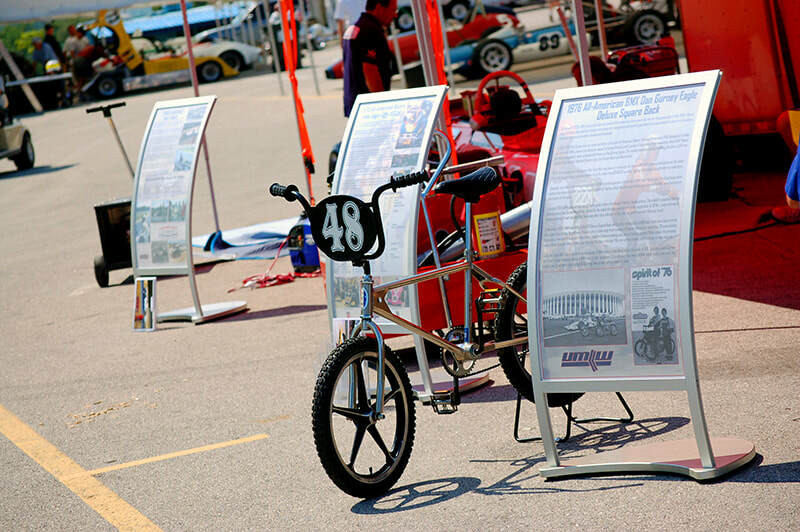 Nearly every kid had a bike, and local tracks were setup for competition and overall good times. Everyone wanted to get in on the action, including motorcycle builders Yamaha and Kawasaki. 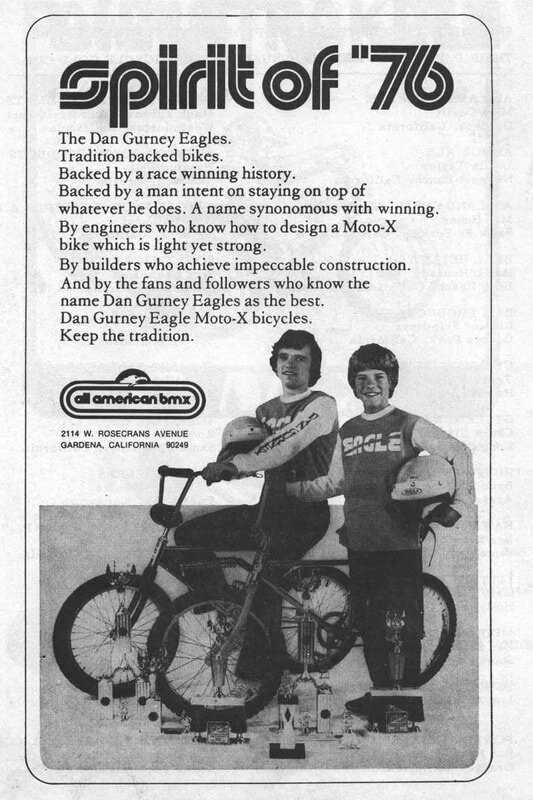 In 1975-1976, Dan Gurney lent his name and some of his and All-American Racers' technical knowledge (Phil Remington) to help All-American BMX, a local manufacturer, market three models of BMX bikes. These creations were subsequently known as Dan Gurney Eagles. 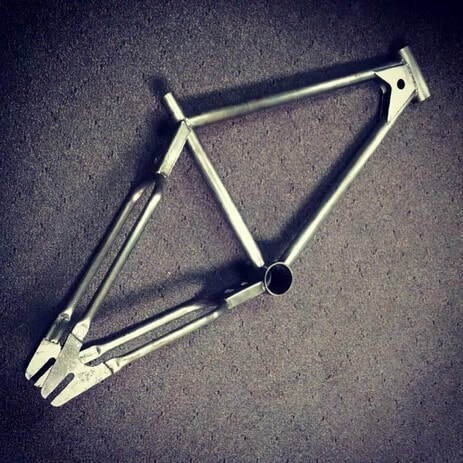 There were three models manufactured by AABMX in Gardena, California, the Hardtail, Hardtail Double-Loop and Monoshock. While the company ran into issues after less than two years in existence, it's time in BMX leave a lasting impression on the sport. First, the vintage bikes have been known to go for more than $1500.00 on eBay, making them somewhat highly sought after by collectors. Secondly, two riders who were involved with AABMX became legends in the sport. Mike Devitt and Scot Breithaupt were both on the scene at AABMX, and latter came to start SE Racing, which has been one of the most successful BMX manufactures in the history of the sport. In August 2008 we came across one of these gems a mere 15 minutes from the KMPR headquarters. The model in question that we have obtained is a Dan Gurney Monoshock, serial number 1323, named for the shock that was used as part of the suspension. The serial number is the lowest we have seen yet for one of these bikes, which have been as many as five digits. We are currently not sure of how many of these jump-masters were made, but if you look around, there are a few out there for sale. If you are really lucky, you can find one with the Dan Gurney Victory Mags. That's right, mag wheels on a BMX bike. The main problem with the design of the bike was around the idea of a shock as a member of the frame. When a rider goes to pedal, the shock takes up the force load that is generated to the rear wheel, thus causing the tire to lose traction and spin. We later sold the Mono-shock to a collector in Ohio. A year later we found a 1976 Deluxe Hardtail, which is the rarest of the AABMX line, photos and details of the rare bird are coming soon. For more information on the various types of AABMX Eagles, visit www.bmxmuseum.com to see some of the lucky few winged-wonders that have made it through the years.